This is the week when the internet moved on - and we are only on day two! Twitter's recent homepage redesign perfectly captured this new online world with the phrase 'Share and discover what’s happening right now, anywhere in the world' and all the major online protagonists are developing in this space - this week Facebook and Google have responded to recent moves by Microsoft, Yahoo!, Twitter and others. Here are 10 examples of how the internet is moving towards right now / instant information and becoming a 'Real Time' social web. At the SOMESSO conference in London I was on a panel and was asked whether I thought Twitter was the future of the internet. 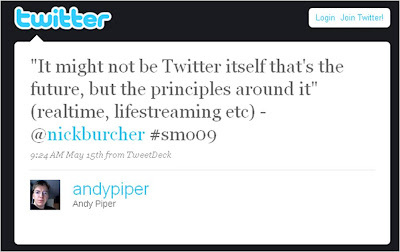 My reply was that I didn't know whether Twitter was the future, but the principles espoused were very significant. 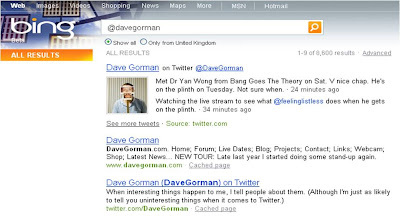 Twitter Search and Twitter Trending topics are the things that have really kickstarted the move to the real time web. Being able to see what people are saying about any event, product or person, instantly, has proved to be tremendously powerful and set the tone for future internet evolution - the moves of all the major players are based around responding to this challenge. Google have revealed that they are working on a new Search interface dubbed 'Google Caffeine.' There have been rumours around for a while that Google have been tweaking the algorithm to give more prominence to current information, but Bobby Johnson in today's Media Guardian has highlighted a post on the Google Webmaster Central Blog. Google write "For the last several months, a large team of Googlers has been working on a secret project: a next-generation architecture for Google's web search. It's the first step in a process that will let us push the envelope on size, indexing speed, accuracy, comprehensiveness and other dimensions." 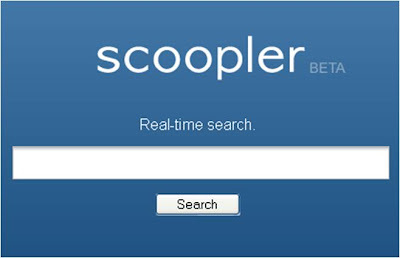 Scoopler is a new 'real time search engine' aiming to trawl a wider range of information than Twitter Search - though due to the regularity / volume of conversation on Twitter, Scoopler results tend to be dominated by Tweets. URL shortening is used by many self-publishers - and particularly on Twitter where number of characters are important. As rival service tr.im stated yesterday (in the release announcing their closure) 'Twitter has all but annointed bit.ly the market winner' in the URL shortening battle. However, the real value of bit.ly will be derived from the data it holds - the most clicked and distributed /tweeted URLs on the internet. It is therefore no surprise to hear that Bit.ly plan to monetise this information as a premium insight package for advertisers. Delicious, Yahoo! 's bookmarking service was one of the early players in tagging, bookmarking and sharing web links. Delicious has suffered though from a lack of development, but has recently announced a new addition to the service - 'Fresh Bookmarks'. Traditionally it took some time for Bookmarks to surface in the Delicious 'What's Popular' section, but Fresh Bookmarks now factors in other more immediate metrics like Tweets and Links to allow Delicious Fresh Bookmarks to be faster and more useful. 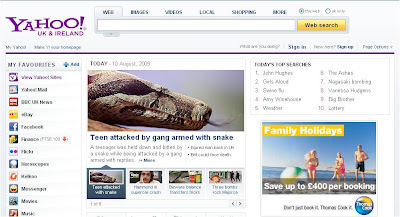 The new Yahoo! homepage now features 'Today's Top Searches' - another example of showing what's happening right now. 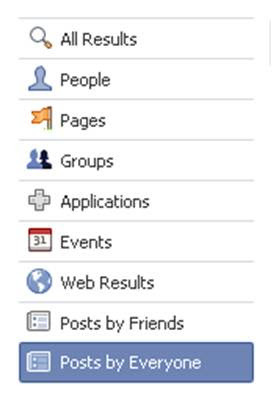 Facebook Search has just re-launched with the ability to Search all available content from Friends, public profiles, Pages, Events, Apps and get aggregated results in one place. This provides a rich stream of information from across the platform - finally opening up Facebook to allow useful content analysis in real time. 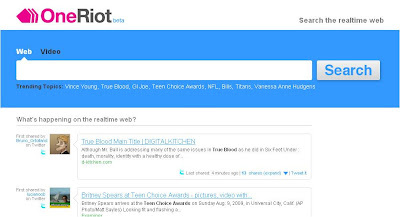 One Riot is another new, venture backed, real-time Search Engine. "Increasingly, the web's most interesting content is what our friends and other people are talking about, sharing and looking at right now. However, when people search for that content, traditional search engines struggle to surface these fresh, socially-relevant results. That's the hole - and it's a big one - that OneRiot is filling. OneRiot crawls the links people share on Twitter, Digg and other social sharing services, then indexes the content on those pages in seconds. The end result is a search experience that allows users to find the freshest, most socially-relevant content from across the realtime web." Perhaps the most elegant Real Time search functionality is presented by Friendfeed (and maybe the reason behind the Facebook acquisition?) Recently added to the Friendfeed platform Friendfeed users can use Friendfeed Search to discover content in a variety of ways. 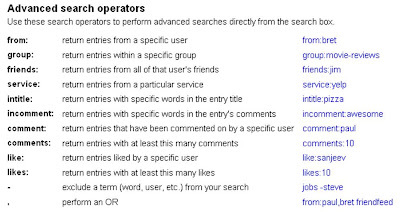 Searches can be conducted (amongst others) by site, by user, by group and by keyword + narrowed down through a variety of filters such as 'OR', 'likes'. All of this means that the web has changed en masse with Real Time at the core of the latest iteration of the internet. Listening tools can aggregate this vast quantity of data and the advanced Listening tools can analyse for sentiment, venue etc. The advent of real time is a huge opportunity (and challenge) for every company using the web for business - challenge one is finding the information, challenge two is being set up in a way that can respond to it! So who else should be on the list? Tweetmeme? Digg? StumbleUpon? Facebook Real Time Search - is it finally coming? Search Engines show wrong Michael Jackson! & trust me, I didn't see this before I wrote this - http://digital-examples.blogspot.com/2009/08/tale-of-two-url-shorteners.html - which is essentially an expanded version of your point 5. It's actually a post that was ready to go a couple of days earlier, then Facebook update their search and buy Friendfeed, tr.im has issues, Google launch caffeine etc and the whole thing had to be re-written! Guess it's a sign of how quickly everything is changing and I agree with the point in your post - "to monetise services you need to be imaginative - paid services, premium options, and advertising are not the only options". Going to be really interesting to see where all this leads! It's a good list, but I think surchur should be on the list as well. What is really great about our real time search engine is that it turns you into a searcher and a discoverer at the same time. We think it's just as important to discover what are the trending topics, people, places...as it is to search in real time for fav topics in several different sources simultaneously.